INSPIRED BY GREAT BRITISH BAKE OFF! I love Great British Bake Off. If you’re reading this in another country I’m sure you have your own versions of this cookery phenomena. Unlike Masterchef it attracts everyday home bakers using those minimal ingredients we can afford to try out for ourselves. Through Twitter and Facebook we’ve been anticipating innuendo and innovative recipes for weeks, then days, hours and a final countdown in minutes! Butter, eggs, flour, sugar – in it’s many forms, to create such variety of outcomes. I’m always impressed at their bravery – being watched while you attempt a delicate manoeuvre is not for the faint hearted. 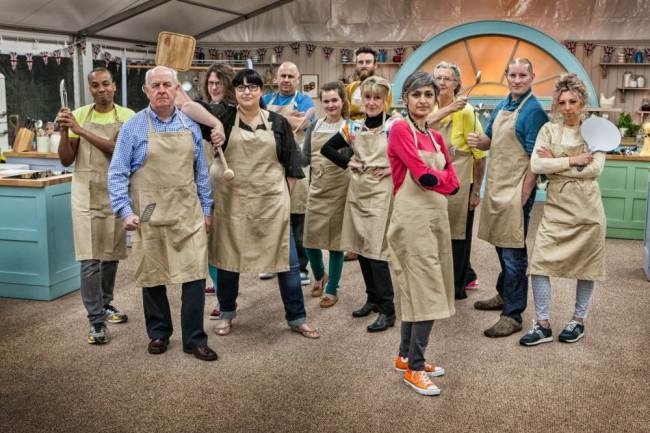 Last night’s first programme of the series showed this years contestants are all good bakers – not one of them unable to rescue a problem – just as you have to re-jig at home after a disaster. My family say to me – you should apply – oh no I shouldn’t – I’m not skilled at piping, beautifying and those intricate pieces of chocolate work would have me trembling with nerves. What it has done is inspire me to carry on learning. Until two years ago I was unsuccessful at bread. Now I wouldn’t dream of buying it. Home made bread is part of our life and routine. So this Autumn I’m booked on an Italian cookery course and I’m searching for a basic piping class. How many of us will be attempting Swiss roll this weekend? Inspired by those superior home bakers entertaining us every Wednesday evening – good luck to them all!